ODF’s organization design is based on a shared leadership model. 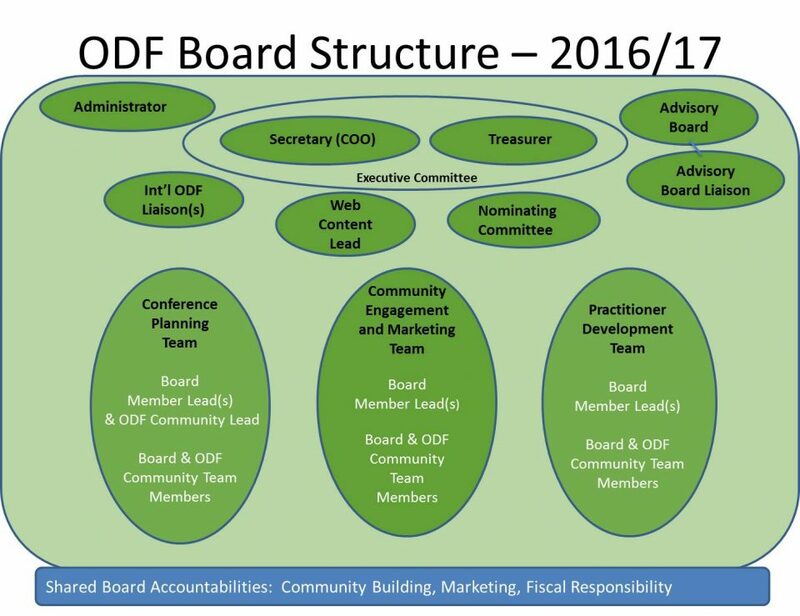 All Board members have responsibility and decision-making authority for a work stream or project, and come together as a team to decide on the overall direction for ODF. There are a few specific operating roles, such as the Secretary and Treasurer, who oversee general operations and financial management. The Administrative Support role is foundational to running the organization on a day-to-day basis. ODF has an Advisory Council made up of seasoned organization design professionals and senior business executives, who provide us with strategic guidance. Through our international ODF liaisons, we look for synergist opportunities to increase interest and deliver learning opportunities for organization design practitioners around the world. ODF community members play an important role as co-leaders and contributors to our different activities.